A few big names in design have chosen their “colors of the year.” Benjamin Moore Paint is promoting a soothing yellow “Lemon Sorbet.” Pantone, the color giant, has chosen Emerald, a greenish blue that is described as richer than turquoise and deeper than aqua. Either of these colors would give any room a fresh and unique look. Use a unique wallpaper pattern or bold paint color to make one wall the focal point in any room. Hang complementary art on that wall and move a nice piece of furniture there. Well-placed decorative pillows, as well as custom fabric window treatments, can add unique patterns and textures any room. 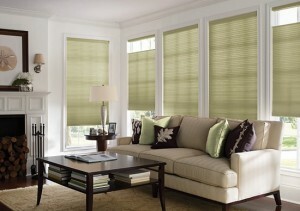 They can also bring color schemes and themes together from room to room. Whether it’s yesterday’s mail, last week’s schoolwork, or a month’s worth of coupons, disorganized spaces detract from any room’s design. Create storage spaces for common clutter such as for papers, mail, toys, coats, and other items that can take away from the style of your room. We’re proud to serve the greater West Palm Beach area. Please contact us at 772-220-8870 or visit our showroom in Stuart, FL, for more information about our products and services. Contact us to learn more.